Destroy gems and battle monsters in this puzzle-solving sequel. Personally, we didn't have issues with Puzzle Quest Galactrix. 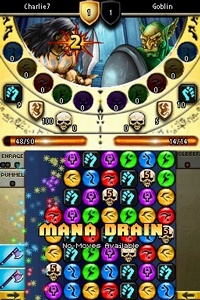 It offered a nice gameplay twist to the original Puzzle Quest: Challenge of the Warlords, while shifting the narrative from medieval times to a sci-fi theme. That said, many players didn't consider it a true sequel. If you fall into that camp, don't worry. That'll come soon enough, with Puzzle Quest 2 on the way. Developed by Infinite Interactive, the same team that worked on the original Puzzle Quest and Galactrix, Puzzle Quest 2 starts off on the right foot. You select from four different classes and then choose between male and female characters. The classes vary, between Templar, Sorcerer, Barbarian and Assassin. Each one has a unique set of attributes. The Assassin, for instance, plots his or her next move, but has weak Hit Power. Meanwhile, the Templar is the opposite, annihilating enemies with strength. From there, you'll slip into the game's combat, which is mostly the same as the original. It works on a similar level as Bejeweled, as you'll match up rows of three or more of the same color to eliminate them from the playfield. 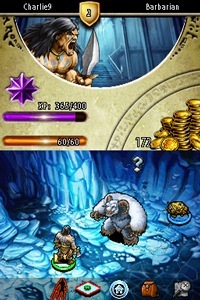 However, Puzzle Quest throws in exceptional role-playing elements. Line up three or more skulls and you'll damage your opponent. Gather the right amount of colored mana and you can activate spells. This time, there are some new icons to match up. The addition of gauntlets enables you to use a weapon. Line up enough of them and you'll destroy some of your opponent's life bar. You can also collect defensive icons to keep your HP from taking severe damage. On top of gameplay improvements, Puzzle Quest 2 also has a new world hub. Rather than explore a map, you now walk through areas, interacting with characters (or enemies). It's similar to what Infinite Interactive developed with its Konami game, Puzzle Chronicles, but much improved. Puzzle Quest 2 features a strong single-player campaign that'll take you several hours to complete, along with two-player versus action with a fellow cartridge owner. Sadly, we didn't get a chance to test this mode out in our hands-on time, but if it's anything like the original Puzzle Quest, you won't find us complaining. As for Puzzle Quest 2's presentation, it's not entirely different from the first game, save for the new world hub and the characters from each class. Some models (females) look better than others (male), but as a whole, Infinite Interactive shows a great deal of improvement. The music is equally impressive, carrying the same medieval themes as the first Quest. We're in for yet another addictive puzzler in later spring/early summer when Puzzle Quest 2 arrives. The new weapons, character classes and hub worlds should keep combo-building enthusiasts coming back for more. Look for a review after the game's release.